PermaFlo™ - Products - Procedure - Ultradent Products, Inc.
PermaFlo is a light-cured, radiopaque, methacrylate-based flowable composite available in eight shades. Its thixotropic properties impart ideal flowability for improved adaptation. 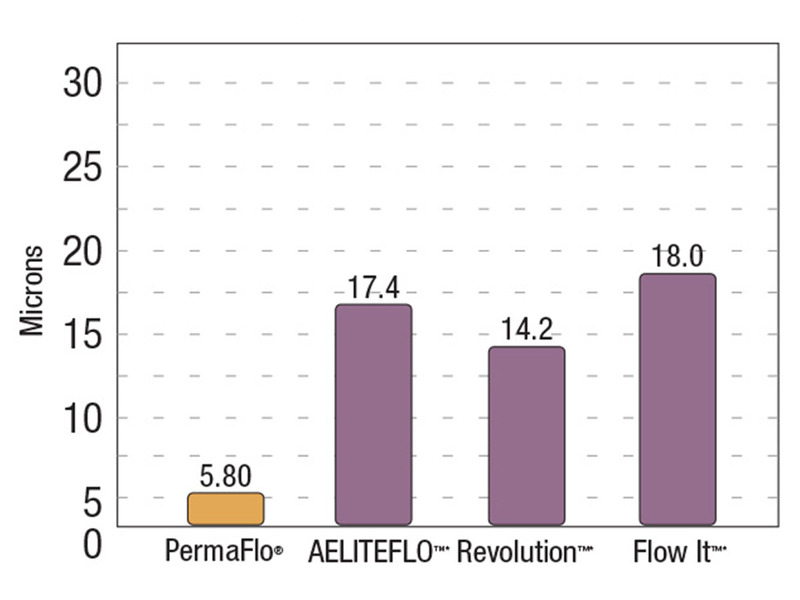 PermaFlo is 68% filled by weight, with an average particle size of 0.7μm and a low film thickness. ​Use PermaFlo for anterior and posterior restorations: Class I, II, III, IV, and V. It can also be used to restore missing subgingival tooth structure prior to endodontic procedures (the “Donut Technique”). It is highly recommended for Class III and V restorations, or for the lower layers when using incremental building of composites. ​Masking dark colors initially facilitates gorgeous esthetics at the surface. Place a thin layer of PermaFlo Dentin Opaquer over the exposed metal and light cure for 10 seconds with VALO®. For curing lights with output <600 mW/cm2, cure 20 seconds. Photo courtesy of Dr. Howard Strassler. ​After the bonding agent, apply a thin layer of PermaFlo at the gingival margin, proximal box axial margins, and internal line angles to ensure quality adaptation of composite. PermaFlo exhibits very low film thickness. 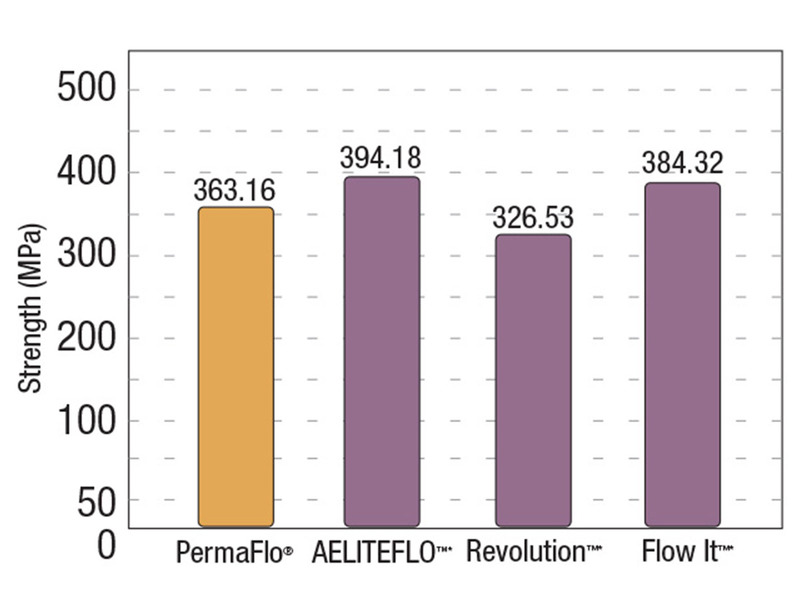 PermaFlo performs favorably with other flowable composites. Being 68% filled, PermaFlo provides very high compressive strength. ​PermaFlo’s high fill and high flow give you the best of both worlds. It’s 68% filled for high strength. But it’s also highly flowable, making it ideal for metal masking, micro restorations, or as a super-adaptive initial layer beneath composite restorations. Its all-out flow makes it easy to place during restorations, while its maximum fill ensures it stays extra strong. PermaFlo shades offer superior polishability, and afford excellent translucency for matching, blending, and depth of cure. ​Use PermaFlo for the “Donut Technique” to achieve extension of root when retention of clamp would otherwise be difficult or impossible. ​The flowable composite is highly radiopaque, so you’ll never have to wonder if what you’re seeing is dental material and not tooth structure or caries. ​PermaFlo is gluten free, so it fits in with the lifestyles of patients from any background. ​Small Class I preparation treated with dentin bonding agent. Fill restoration with flowable PermaFlo through the Micro 20ga tip. ​The flowable composite offers unsurpassed adaptation as it fills from preparation floor up. ​Finished radiopaque, 07μm hybrid restoration. Ultimate restorative seal! ​Rampant caries in a 3-year-old. ​Slow speed and large round bur to remove all caries. Stain with Sable™ Seek® to ensure prep is in firm mineral dentin. (Compromise where close to pulp.) Quality tissue management is an absolute here; pack a long #0 or #1 Ultrapak® cord soaked in ViscoStat® first. ​Etch preparations and apply Peak®. Light cure for 10 seconds with VALO. For curing lights with output <600 mW/cm2, cure 20 seconds. Apply a thin first layer of PermaFlo to the adhesive layer with the Black Micro® 20ga tip. Light cure. ​Apply and cure 1 or 2 additional increments. Quickly finish restorations with finishing burs and abrasive cups. ​PermaFlo allows us to restore in so many different situations. The material seems to 'flex' better in those difficult Class V restorations, which serves us and our patients more successfully. ​I literally use PermaFlo on every patient. I love the shades and the way it flows and handles. I use it around my posts, prior to core buildups. The stuff is awesome! ​The opaque PermaFlo shade is a terrific tool for difficult esthetic restorations. It allows me to mask metal when repairing a PFM crown and eliminates the grey hue. I am able to cover dark stains and restore the tooth to its natural beautiful shade.